Long haul flights often mean exotic, exciting locations, and you want to make the most of every second. 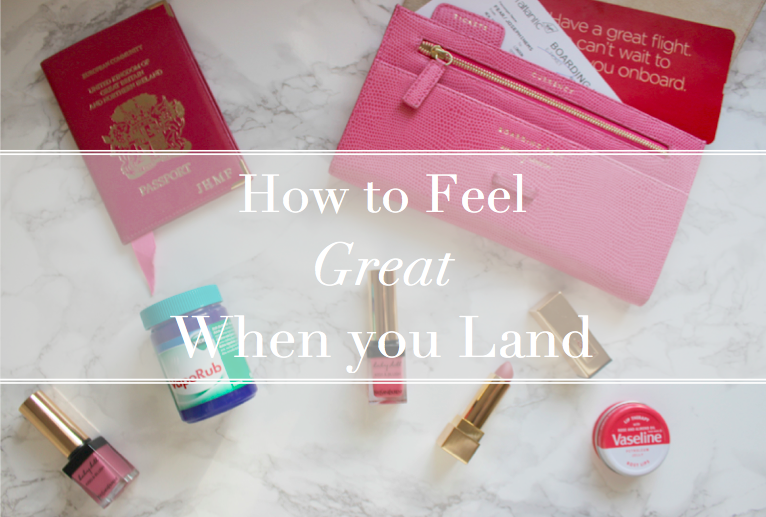 It’s no fun then if you step off the plane feeling like a zombie, so here are my tips for feeling great when you land. It’s no coincidence that the drinks trolley is so appealing at 30,000 ft. Humidity on a plane falls to 5%, compared to the 30% – 50% that we live in. This creates thirst so you should aim to drink an extra 250ml an hour on top of your normal intake. Low blood oxygen levels also make you more light headed, so go steady on the alcohol! Your skin needs rehydrating too, take a look at my Long Haul Flight Beauty Tips here. Here’s a crazy fact. As the plane climbs, the change in air pressure knocks out a third of your taste buds. But fear not as there’s an antidote, tomatoes! Whether in food or juice, they are one of the few things that still taste normal at 30,000ft. Oh, and more importantly, ice cream still retains it’s full flavour! It can’t just be me that gets a bit ill after a long flight? After 3 hours, the mucus in your nose (ew) evaporates in the air conditioning (double ew). You should enter virus defence mode by using a nasal spray like Vicks before you board, and washing your hands or using sanitiser before eating, and after touching communal surfaces like luggage compartments. Being immobile for so long slows blood flow enough to cause a blood clot so you should walk around every hour or so, or circle your ankles to activate your muscles. If you suffer from that nauseous feeling, it’s caused by a mismatch between what your eyes see, and what the balance mechanism in your ears feels. I find it helps to either close eyes, or fix on a point in front of you and take a deep breath. If you like to listen to music during the flight, sound might be muddled when you take off the headphones because of mechanism that protects your nerves. It will wear off soon after landing but if you fly frequently, sitting nearer the front will help as engine noise is quieter. The best way to avoid jet lag? Sleep. If you can, sleep on the plane. I try to eat a heavy meal at the airport which can knock me out on the flight, and then I get comfortable in a blanket, travel pillow and eye mask as soon as possible after take off. If you still have some jet lag, you can find my top tips for curing it here. What are your tips for feeling great when you land? Next Post The Blogger Made Me Buy It!